How Sleeping with the Lights on (Literally) Changes our World. Lately, I’ve trained myself to fall asleep with a warm, orange glow in the background. While it does make me feel safer and more secure, monsters under the bed (whether figurative, literal, or otherwise) are not my primary reason for sleeping with the lights on. 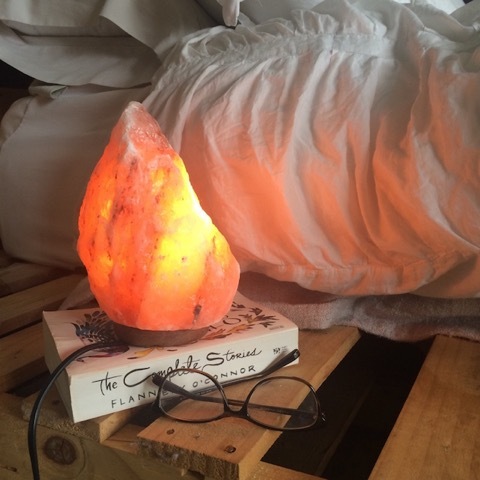 Himalayan salt lamps have health benefits believed to stem from the emission of negative ions, which help to balance the positive ions that can plague our environment. For a brief throwback to science class, ions are microscopic particles that carry an electrical charge. Normally, molecules in the air contain the full complement of electrons and thus are electrically neutral. However, when an electron becomes knocked off a molecule, it is left with a positive charge. All living systems are bioelectric in nature, and so these electrically charged ions affect the way we humans feel and act, as well as impact our environment as a whole. Scientific research has shown a stark difference between our moods and states of health when surrounded by positive versus negative ions. Common devices that emit positive ions include electronics, air conditioners, microwaves, vacuum cleaners, and even hair dryers, whereas negative ions occur more often in nature, created by lightning storms, waterfalls, sunlight, and ocean waves. Similar to the effect being near the ocean has on our bodies and minds, these lamps, made from pure Himalayan sea salt surrounding a light bulb, come stamped with health claims ranging from alleviating symptoms of depression to enhancing breathing and even ailing allergies and the common cold. I first purchased a Himalayan salt lamp earlier this summer per a friend’s recommendation. At the time, I was working a full-time job in addition to an apprenticeship with elephant journal. I would spend my weekdays in a hectic environment, primarily in front of a computer screen, to return home and sit on the floor of my bedroom, working for elephant until I went to sleep. Needless to say, this lifestyle was not sustainable, and I quickly found myself facing a host of symptoms of vata imbalance, including anxiety and insomnia. Nevertheless, I was unwilling to give up the apprenticeship, as writing, for me, is a source of joy and fulfillment. I needed a way to healthily pursue my passion project without reaping the negative side effects of the positive ions emitted from the computer. Neutralized airborne particles including mold, bacteria, and allergens (which carry a positive charge), thus facilitating an easier breathing experience, particularly for those who suffer from allergies. Cleaner air through the scientific process of hygroscopy, which attracts and absorbs contaminated water molecules, locking them into the salt crystal, thus removing smoke, dust, and other contaminants. Increased serotonin levels to promote calmness, improved overall mood and reduced symptoms of depression as well as seasonal affective disorder. Improved sleep, as overexposure to positive ions reduces the brain’s blood and oxygen supply, which can consequently cause disruptions to sleep. Increased daytime energy and an enhanced sense of rejuvenation, similar to the way we feel refreshed when out in nature. Following the lamp’s arrival in my bedroom, I noticed an improved ability to sleep deeply and without interruption, relatively speaking. I also felt calmer and more peaceful while working by my computer at night. I will note that there are other routines I engage in nightly to promote calm, restful sleep, including turning off the computer at least an hour before bed, turning off all electronics (phone on airplane mode) during sleep, engaging in light stretches, rubbing oil on the feet, drinking powdered magnesium mixed with water an hour before bed, reading (a book, not a screen) and meditation. The first night of sleeping with the lights on took some getting used to. I laughed to myself as I rolled over in bed, pulling the covers over my head and contemplating the weird “mood lighting” I had going on in my bedroom. The glow it emits is rather seductive. The lamp I purchased is small, so it does not emit enough light to read by—it’s closer to a slightly brighter version of a nightlight. The first few nights with it I woke up in the middle of the night, finding it too bright and turning it off. However, after about a week I adjusted, and now love sleeping with it on. It also makes waking up easier—no need for a bright lamp burning my eyes as I make the trip from dreamworld to awakening. Bonus read: Coming in From the Cold. Dear Elephant Journal, it is interesting that this 2016 article has been reposted in light of the legitimate criticism it received. You made a couple of statements in this article that are not grounded in facts, thus all the blowback in the comments section. Saying: “Scientific research has shown a stark difference between our moods and states of health when surrounded by positive versus negative ions.” The studies cited in the article you link to (also quite flimsy in it’s assertions and conclusion) are about observations of rats and mice, most definitely not about “us.” You cannot make those kinds of leaps of logic. And that salt lamps “come stamped with health claims ranging from alleviating symptoms of depression to enhancing breathing and even ailing allergies and the common cold.” I hope (for their sake) that no company is foolish enough to make such claims for their product because they will be subject to regulatory enforcement by FDA, since they cannot support them. You have a fine conversational writing style and I hope you continue honing your craft. Science writing is a wholly different discipline, that typically calls for a science degree (preferably graduate) along with legal and regulatory awareness. There’s a reason most writers just don’t bother with it. The bulb in a salt lamp does not cause it to emit ions or clean the air. Also, keeping an electric bulb burning all night is anything but environmentally friendly. If you want cleaner air in your house, fill it with plants. 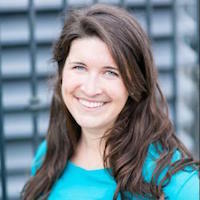 Bretton Keating is a writer, wanderer and daydreamer, passionate and curious about all things related to health of the mind, body and spirit. She feels most alive when dancing in her kitchen barefoot, cooking five things at once and singing off-key. For more of her heart centered pieces, check out her blog. For her creative work, poetry or for your own fairy tale within, here is her website.